Lovely Suzie is looking for a forever home! Suzie would like to be your new best friend! 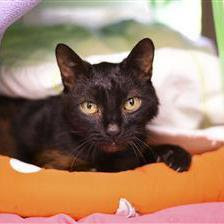 She is a beautiful little cat who craves company and loves nothing more than a good chat. She adores fuss and affection and goes loopy doing roly-polies of joy when you stroke her. If you want to find out more about Suzie visit her profile at Wood Green now! 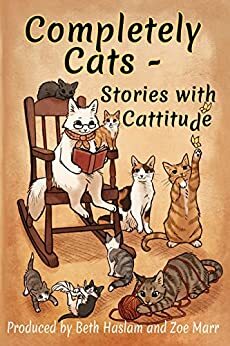 Completely Cats - Stories with Cattitude was only released yesterday and we are so happy to see that it's already doing extremely well on Amazon, and no doubt it's thanks to some of you! As my rescue story is featured in this pawsome book, that's one great reason to buy it. But it is also brimming with other fantastic cat stories for you to read as well. And the most important thing of all is that some of the money raised from sales will be donated to International Cat Care so we so glad to be a part of it all. When Beth and Zoe set out to help cats in need through the charity, International Cat Care, they were amazed at the response. Incredible true stories poured in from cat lovers around the world. As varied as cats themselves, each story is guaranteed to delight, and each book purchased will help support the work of International Cat Care. Victoria Twead, New York Times bestselling author of Chickens, Mules and Two Old Fools. Get your copy now from Amazon worldwide! Disclosure: I received no compensation for this post. As a rescue kitty myself I want to help other rescues find their forever home, so each week on Charity Tuesday I share adoptable cats from Wood Green, the Animals Charity (which is where I was rescued). Mum and I are so grateful to this amazing charity because without them we would never have found each other! Please note however that this post does contain some affiliate links. This means if you click on the Zazzle or Amazon links to purchase any of the items featured, I will receive a small affiliate commission. Suzie is adorable! Fingers and paws crossed that she gets a home soon! Ooo a book to add to my reading list! Awesome! Suzie...how cute are you! Some lucky human is gonna love you! Suzie is a real sweetheart! Suzi is a real cutie! And Athena! Your story is in a book!!??!! Wow! I shall have to see if my Mommy will get a copy, especially since the proceeds are for such a great cause! Such a beauty, I hope she gets a forever home soon. Suzie looks like a curious little love bug. I hope she finds her forever home soon. Suzie is just gorgeous and we so hope she gets her furever home asap! The book looks fabulous and Amber is just off to Amazon to get a copy to review - woo hoo! Thanks fur sharing and congrats to you on being in it - another WOOOO HOOOO! Thank you all for your lovely replies. 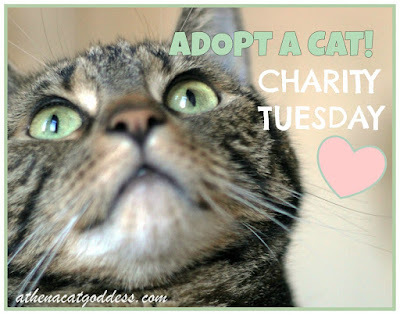 Let's hope we help a lot of kitties!